France may have just celebrated Pancake Day on February 2nd, but for everyone else, Shrove Tuesday is just around the corner. But before we say goodbye to all things delicious, life-affirming and artery-furring in exchange for kale, goji berries and juice cleanses, we deserve one last hurrah. With the full works: meat, cheese, cream, butter, sugar, chocolate, alcohol… As a certain Holllywood star/macrobiotic food warrior might say, it’s all good. (As long as it’s before February 28th, of course). 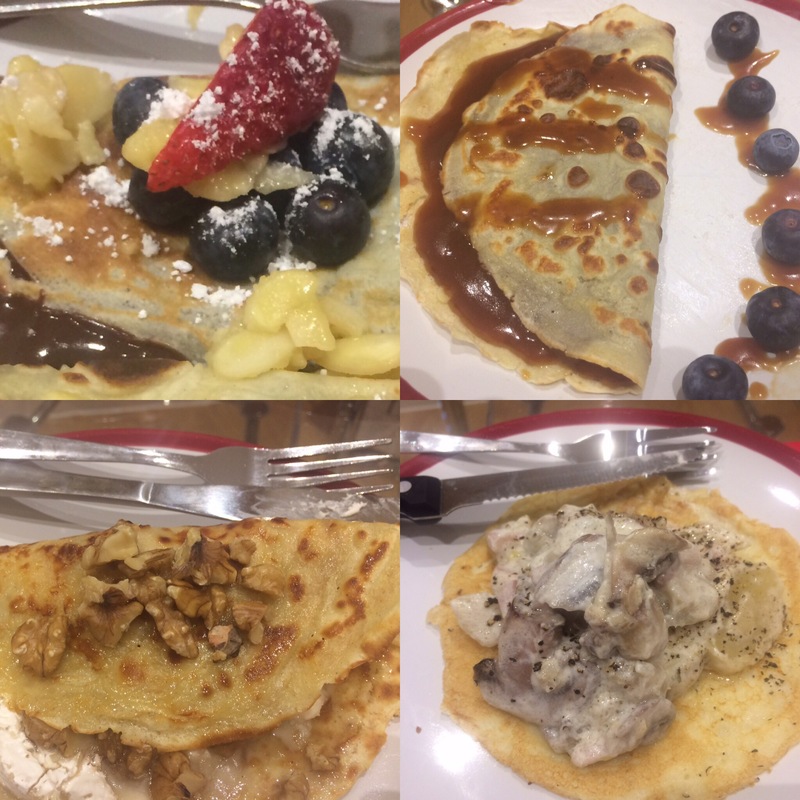 So if you’re after some ideas for Shrove Tuesday filled with wall-to-wall yumminess and indulgence, why not take a look at these four French-inspired recipe ideas below? And as I’m guessing you’re already a French food fan, why not have a look at my posts here, here and here on how to find the most delicious things to eat in Paris, where to get the best Paris hot chocolate and how to make delicious French hot chocolate? 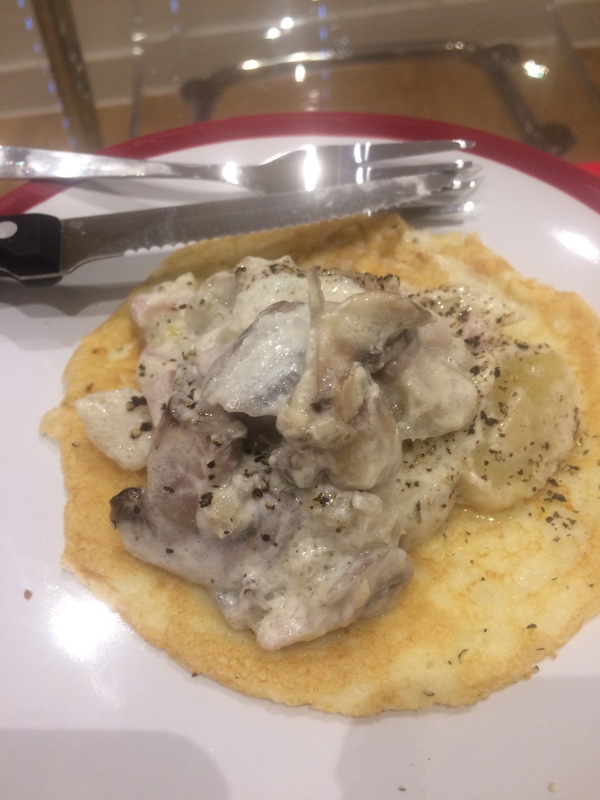 For the ‘galettes’ (a savoury pancake) and crêpes (sweet pancakes), I used Felicity Cloake’s brilliant recipe here. Merci Felicity for these amazing crêpes!! 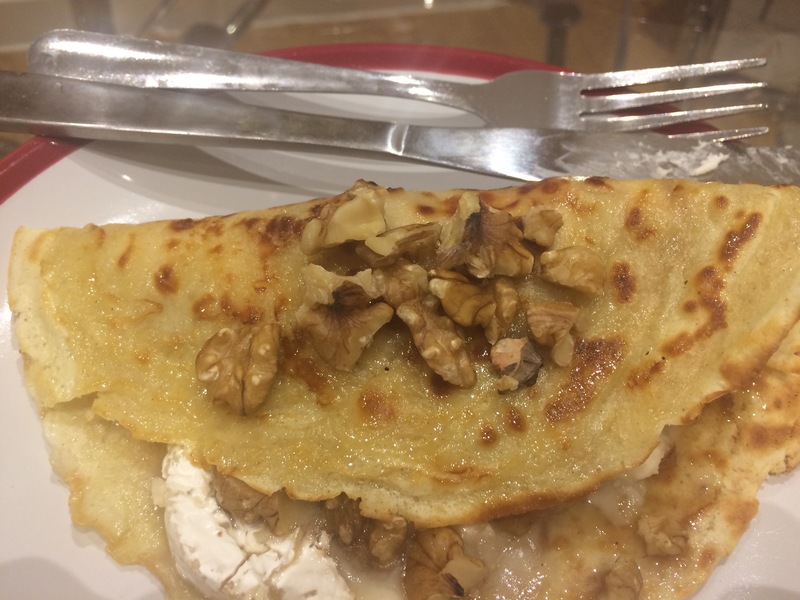 There’s a great crêpe recipe here that’s suitable for vegans – just leave out the brown sugar for the savoury version. 1. 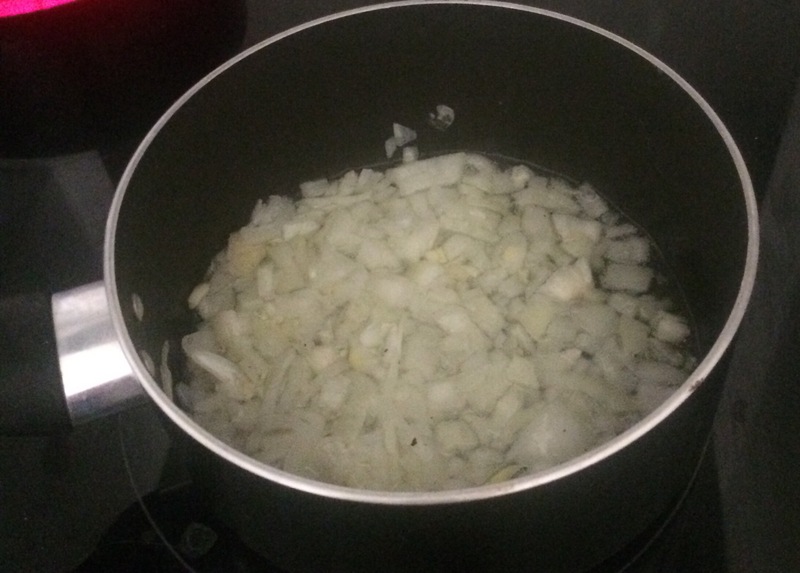 Fry the onions in olive oil or butter until they’re translucent. 2. 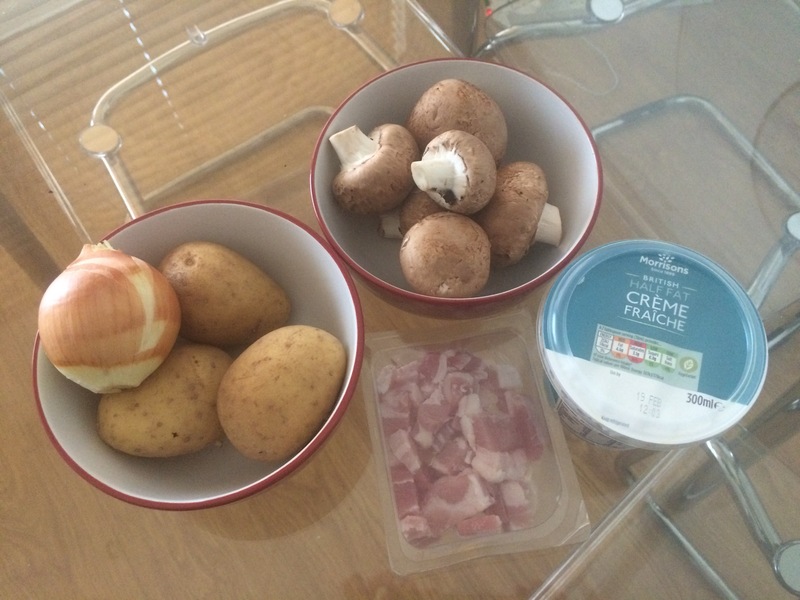 Put the potatoes on to boil in a separate saucepan and leave them to cook for 10 to 15 minutes. Some suggestions to pass the time: get through about 5 pages of À la recherche du temps perdu, have a quick language-learning session on Duolingo, mix up a quick cocktail (or pour a cider) to have with your crêpes later..
3. Add the pancetta cubes to the onions, and cook then until they’ve browned into crispy nuggets of meaty deliciousness. 4. Check on the potatoes (you want them to be cooked but still firm). If they’re done, drain them in a colander and add them to the pancetta and onions. At this stage, you can also be a renegade and add some mushrooms into the mix. (Especially useful if you’re vegetarian, and don’t want to miss out on the fun but can’t be tempted over to the Dark Side of meat-eating). 5. 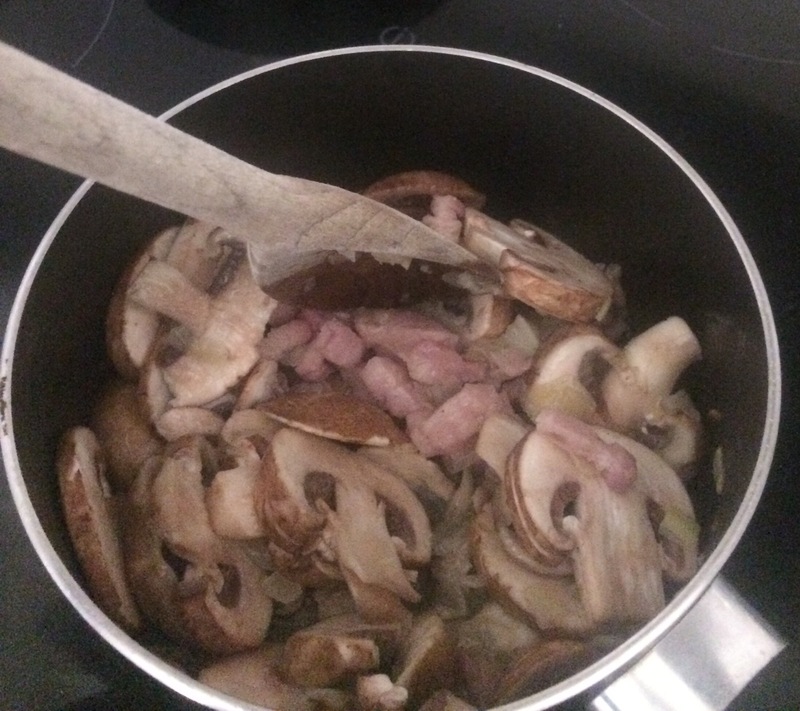 Cook the pancetta, potatoes and mushrooms for a few more minutes, and turn the heat down as you add the crème fraîche to the mixture. 6. Sprinkle as much black pepper on it as you can handle. (The goat’s cheese can be easily replaced for vegan cheese in the vegan version of this recipe). 1. Put a frying pan on a low heat, and put a pancake inside to warm up. 2. Place the goat’s cheese slices on the pancake, and leave them for a couple of minutes to melt slightly. 3. Resist the temptation, if you can, to sneak bits of the melty, gooey goat’s cheese from the pan. (I failed miserably). 4. 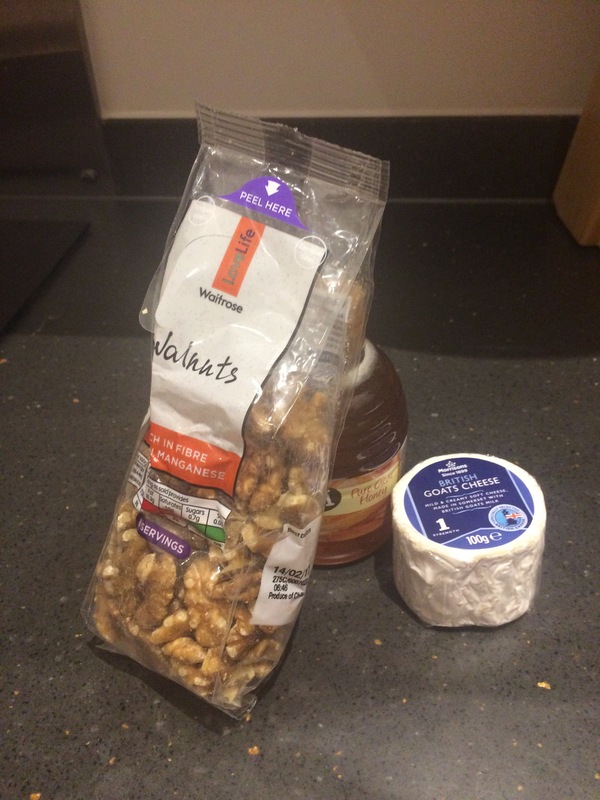 Drizzle the honey (or maple syrup) onto the goat’s cheese, and top with the walnuts. 5. 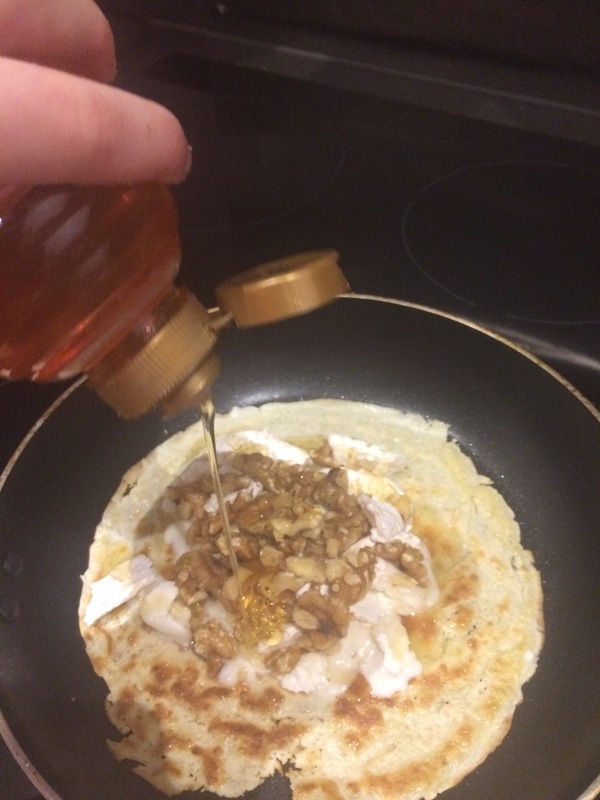 If you’re feeling fancy, flip half of the pancake over like a omelette, and sprinkle even more walnuts on the top for extra crunch. 150ml cream (if you’re making a vegan version, use 50ml maple syrup, 20ml water and 50g cocoa powder instead of the milk and cream). 1. 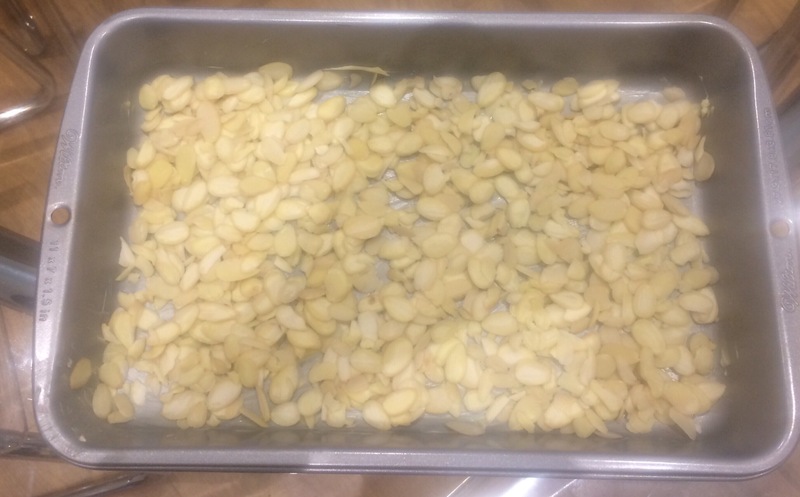 For the caramelised almonds, lightly butter a deep baking tray and scatter the almonds inside it in an even layer. 3. If the sugar crystallises, do some yogic breathing and thank your lucky stars that you’re not on Bake Off, under Paul Hollywood’s piercing blue gaze: stir the crystallised bits gently and turn the heat up slightly to melt the sugar again. 4. When the sugar’s melted into caramel and turned a lovely golden-brown, pour it over the almonds. 5. 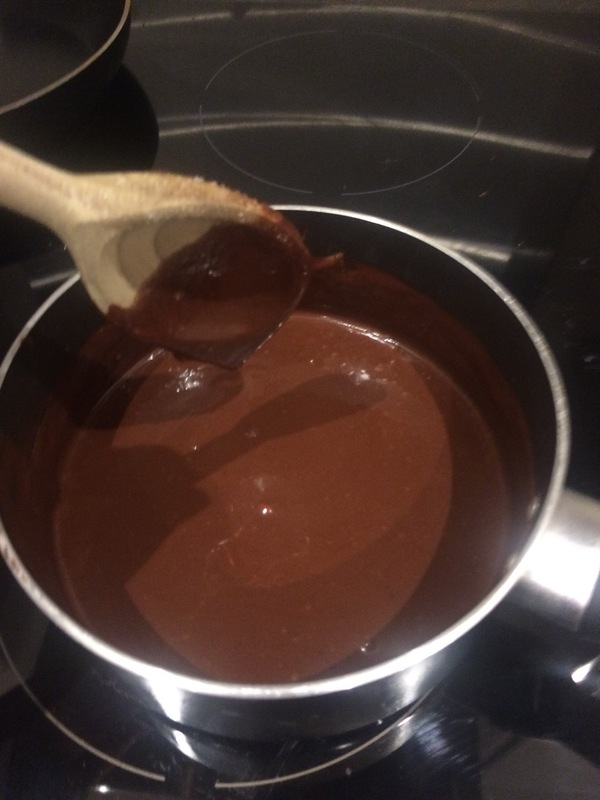 To make the chocolate sauce, place a saucepan on a low heat, and add the cream and milk (or maple syrup, water and cocoa powder for the vegan version). 6. Add the chocolate chunks to the milk and cream (or to the maple syrup, water and cocoa powder), and stir them gently until they’re fully melted. 7. Lay the pancake out flat, and spread the chocolate sauce on it. (This can easily be adapted for vegan diets by substituting the cream and butter for medjool dates and almond butter, à la Deliciously Ella). 1. Place a frying pan over a low heat. Add the sugar by sprinkling it into the pan in an even layer. 2. Wait for a couple of minutes until the sugar has melted fully, stirring occasionally to break up any sugar lumps in the pan. 3. When the sugar has completely melted, take the pan off the heat to add the butter. The sugar will hiss and spit slightly, so it’s best to stand back a bit while you do this. 4. Stir the butter into the caramel, adding the cream once all of the butter has been incorporated fully. 6. Take the caramel sauce off the heat to let it cool for 5 minutes and so it can thicken slightly. Mix in the salt. 7. 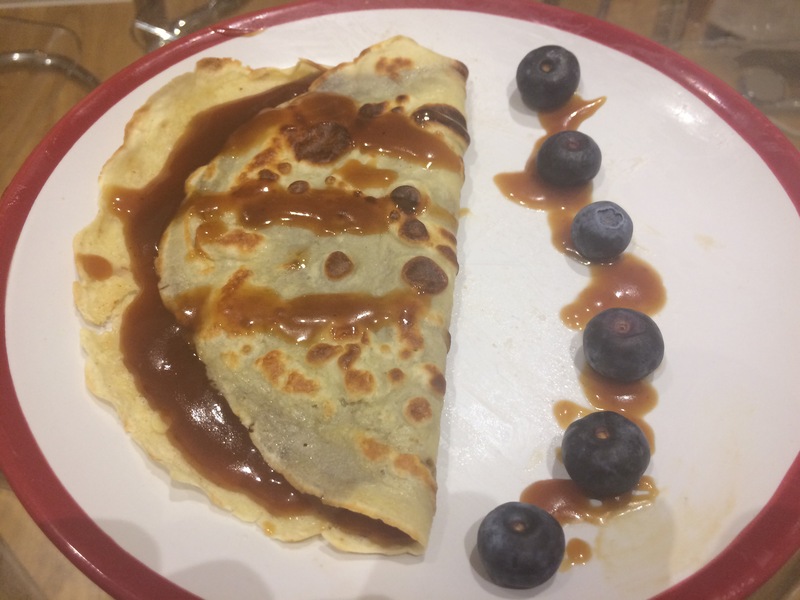 Spread the caramel sauce in the centre of the pancake, leaving space around the outer edges of the pancake. Fold over the pancake, and drizzle some extra sauce over the top of the pancake. 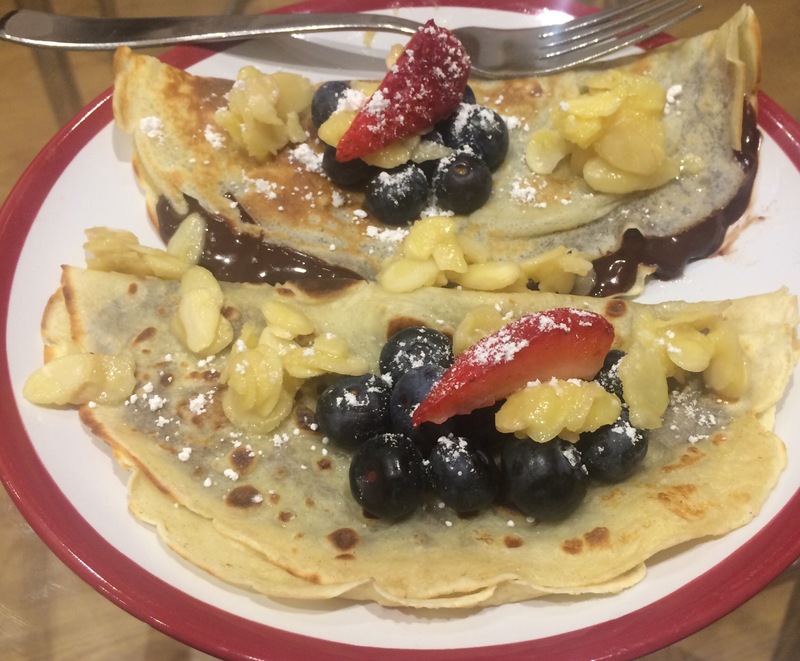 What do you think of these pancake fillings, and what are your all-time favourite fillings? Please do share these recipes on social networks, and tell your friends and family too – I’m looking forward to hear what you think about the recipes!